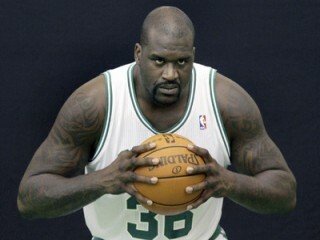 Shaquille O'Neal, nicknamed "Shaq" is an American professional basketball player for the NBA's Boston Celtics. Standing 7 ft 1 in (2.16 m) tall and weighing 325 pounds (147 kg), he is one of the heaviest players ever to play in the NBA. Throughout his 18-year career, O'Neal has used his size and strength to overpower opponents for points and rebounds. After the retirement of Lindsey Hunter on March 5, 2010, O'Neal became the oldest active player in the NBA. Played in 53 games (all starts)…Averaged 12.0 points on .566 shooting and 6.7 rebounds in 23.4 minutes per game…Finished with 21 points on 7-of-9 shooting, including a season-high 7-of-10 from the free throw line and grabbed eight rebounds versus Washington (11/3)…Scored a season-high 22 points against Oklahoma City (1/23) and also netted 22 against Indiana (1/29)…Grabbed a season-high 13 rebounds against Memphis (2/2) while adding 13 points and four blocks…Had a season-high five blocks versus Chicago (11/5) and a season-high three steals at Charlotte (2/19)…Scored 20 points on a season-high 9-of-10 shooting at Orlando (2/21)…From 1/16 through 2/6 averaged 16.1 points and 6.2 rebounds while shooting 64.0 percent from the field in 25.0 minutes per game…Scored 10 or more points 39 times (Cavs were 29-10 in those games) and scored 20 or more points five times (Cavs were 4-1)…Led or tied for the team lead in points twice, in rebounds 16 times, in steals twice and in blocks 16 times…Placed on the Inactive List and missed six games due to a strained shoulder (11/14-11/25) and missed 23 games with a significant right thumb sprain (2/26-4/14)…PLAYOFFS: Appeared in 11 games for the Cavaliers during the 2010 playoffs and averaged 11.5 points, 5.5 rebounds and 1.2 blocks per game…Averaged 13.5 points, 5.0 rebounds and 1.0 block in 23.3 minutes per game against the Celtics during the Second Round. Averaged 17.8 points, his highest scoring average since 2005-06, to go along with 8.4 rebounds and 30.1 minutes in 75 games (all starts), his most games played in a single season since the 1999-00 season…was named an All-NBA Third Team Selection...made 15th career NBA All-Star appearance, second-most in league history (Kareem Abdul-Jabbar)...named 2009 All-Star Game co-MVP (Kobe Bryant), the third such MVP honor of his career…shot an NBA-best and career-high .609 percent from the field, breaking his personal mark of .601 percent set in the 2004-05 season...led the league in field goal percentage for the 10th time in his career, establishing a new NBA record and breaking the mark he previously shared with Wilt Chamberlain...during the season passed John Havlicek for 10th (Nov. 12) on the all-time scoring list...tallied 25 scoring efforts of 20 or more points (18-7) after recording eight in 2007-08...posted 15 games (12-3) of at least 20 points and 10 rebounds after doing so six times in 2007-08...had team-leading 30 double-doubles after recording 21 in 2007-08…had six games of 29 or more points, three 30-point efforts and one 40-point game, his first as a Sun, a season-best 45-point performance on Feb. 27 vs. Toronto...became just the third player in NBA history to score 40 or more points with four different teams (Orlando, L.A. Lakers, Miami, Phoenix), joining Bernard King and Stephon Marbury...the 45 points were his most since March 21, 2003...followed that up with a 33-point effort on March 1 vs. Lakers to become just the fourth player in NBA history over the age of 35 and the first since Michael Jordan in 2002 to score 33 or more points in consecutive games (A. English, K. Malone)...had first back-to-back 30-point games since March 5-7, 2004 and the 78 total points in a two-game span were his most since leaving the Lakers (2003-04)...notched 20 field goals made on Feb. 27...scored 15 or more points in 19 straight games from Dec. 6 - Jan. 29, his longest such streak since the 2003-04 season...tallied 31 double-digit rebounding efforts, including a season-high 17 rebounds on Nov. 22 vs. Portland...made 12 consecutive free throws from Jan. 11-13, his longest streak since April 17 - Oct. 30, 2001...had consecutive games without missing a free throw for the first time in his career (7-7 on Jan. 9 vs. Dallas, 5-5 on Jan. 11 at L.A. Clippers)...missed seven games: four on the Inactive List while healthy (Nov. 7, Nov. 25: Dec. 3, Jan. 15), two due to personal reasons (Dec. 10-12) and one due to back spasms (Jan. 7). Played three seasons at Louisiana State University (1990-92)...named a Consensus First Team All-American following both his sophomore and junior seasons... named college basketball’s Player of the Year by the Associated Press, UPI and Sports Illustrated following his sophomore year when he averaged 27.6 points and an NCAA-leading 14.7 rebounds... in 1992, became the first LSU athlete to be named Southeastern Conference Athlete of the Year...concluded his career as the SEC’s all-time leader in blocked shots...became the first player to lead the SEC in rebounding three consecutive years since Charles Barkley...registered 73 double-doubles…recorded career collegiate averages of 21.6 points, 13.5 rebounds and 1.7 assists in 30.5 minutes in 90 games...connected on .610 percent of his field goal attempts while in college...led the NCAA in blocks as a junior (5.3). Has had a starring role in the motion pictures "Blue Chips", "Kazaam" and "Steel"
Favorite movies include "Scarface", "I Robot" and "The Fish That Saved Pittsburgh"
View the full website biography of Shaquille O'Neal.